Odisha is among the states in India that already are bearing the impacts of climate change in the form of heat waves, cyclones and crop failure from untimely rains. In the discourse and planning for climate action, often women and children are not adequately considered. UNICEF India has the mandate to support interventions in the first 59 months duration of a child’s life to help build a healthy nation. As part of this endeavour, the project carried out through UNICEF India’s support on aligning state policies with resilience needs of children and women, CANSA, Oxfam India and project partners in Odisha organised a technical training for state government line departments on WASH, nutrition and education sectors. The training was held in Bhubaneswar on 27-28 November, 2017 and 40 participants from line departments and civil society attended. This training was preceded by a state-level consultation to disseminate the key findings of Odisha SAPCC (State Action Plans on Climate Change) review done from the perspective of women and child resilience by Oxfam India in the past few months. The technical training sessions were a mix of concepts, case studies, policy analysis and fun activities. 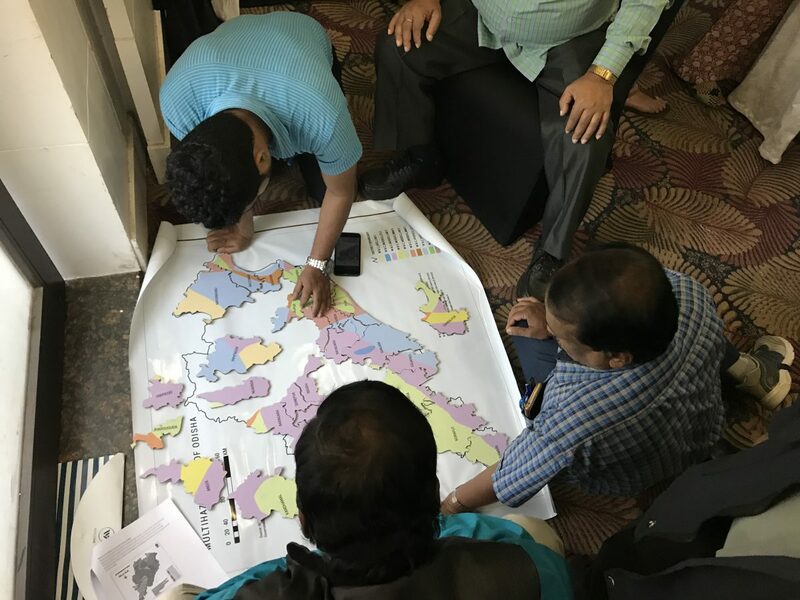 After the first session on day one presented the climate science, challenges and initiatives in India, the participants were offered a choice to go into break-out groups for thematic trainings on each of the 3 sectors – WASH, nutrition and education. In the brief round of introduction, each participant narrated how they were affected by climate change. It turned out almost everyone had experienced some impacts of climate change and many also had a role to play in emergency and relief measures while each one was personally affected. The technical training was based on the review of Odisha SAPCC as well as 3 modules developed on WASH, nutrition and education. In the modules and the training, the policies and schemes relevant to these 3 sectors were analysed and recommendations for aligning them with climate resilience needs of women and children were discussed. Some of the prominent policies and schemes that featured in the training were Sarva Shiksha Abhiyan, Mid-Day Meal scheme, ICDS, National Urban Sanitation Policy, Janani Shishu Suraksha Karyakram, etc. The training programme featured several activities during and between the sessions to keep the participants engaged and thinking. The activities ranged from a jigsaw puzzle – Putting together the Odisha Vulnerability Map – followed with a discussion on the vulnerabilities of Odisha to converting cut-outs of Odisha women into climate resilience warriors by giving her the necessary ‘armour’ and weapons’ using craft paper and stationery such as the armour of safe schools (helmet of a relevant climate curriculum, belt of mid-day meal scheme with wholesome nutrition from clean, hygienic, local foods); skirt of community resilience through assured livelihoods (MGNREGA & entrepreneurship development) and safe drinking water; sword of traditional knowledge; shield of renewable energy use (smokeless chulhas, solar/wind energy for power); and boots of a robust finance mechanism. There were also activities such as ‘Finding the Gap – a micro-perspective’ – that attempted to make the connection of the climate impacts with participants’ jobs. The group inputs eventually became elements of a proposed State Climate Knowledge Mission (in tandem with the national missions for climate change). Put together with a macro-perspective film, these two perspectives enabled the participants to link the elements of the proposed Knowledge Mission with the SAPCC and National Missions under the next activity ‘Match the Following & Bridge the Gap’, in which some gaps were identified by them. Film titled ‘An Innovative Approach to Preparing a Sub-National Climate Change Action Plan’ on Odisha SAPCC by Chief Secretary Mr Behera, introduced the macro-perspective. The last session explored all possible linkages between Education, Nutrition, WASH to ensure a robust comprehensive, integrated climate resilient plan – one that could be taken to the respective departments and adapted into building robust systems.